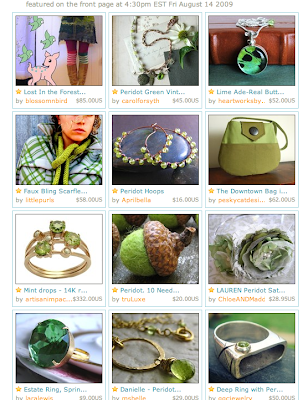 Today my Downtown Bag in Olive and Peridot made to Etsy's front page! The list was created by Etsy using the search term "peridot". I was recently perusing Etsy's gift guides and saw they added a new category called Shades of Peridot to celebrate August's birthstone. I noticed that many of the items that were selected had a similar hue to my downtown bag so I added "peridot" to my tags and description. I often check Etsy's gift guides so I can find categories that my purses can fit into and will tag them accordingly. If you are a seller on Etsy I highly recommend checking the guides often to see what is popular and being featured. Some of your items might be a perfect fit into one of the categories and you just might end up on the front page! congratulations again and thanks for the tip! Do you happen to know what the birthstone for september is? What a beautiful treasury! Congrats again!